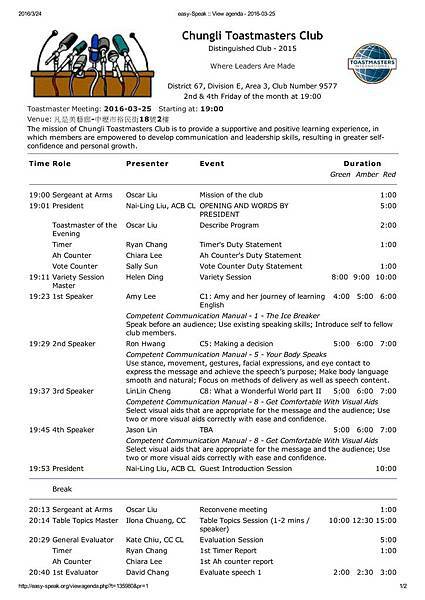 You are invited to join the meeting of Chungli Toastmasters Club on 2016-03-25. The meeting agenda is attached in this mail. Our meeting theme this time will be Photos. All assignment takers please prepare a photo, send it to Oscar beforehand, and prepare a 30-second introduction regarding the photo. We will have 4 prepared speeches tomorrow. You will know our new member Amy Lee much better by listening to her C1 speech tomorrow. Let’s give her our greatest support. Our big brother, Ron Hwang, will give his C5 speech titled “Making a decision”. Ron prepares each speech like attending a speech contest. That’s why he can improve dramatically fast in a short time. 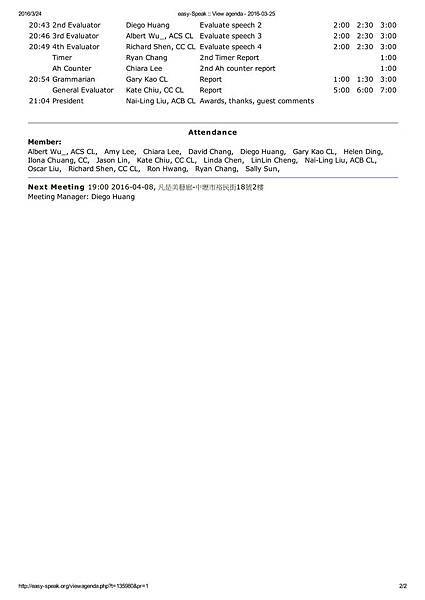 Linlin Cheng, who coordinates this meeting and puts the agenda in place, will give her C8 speech with this mysterious title: What a wonderful world part II. If you are as curious as I am, make sure you come to meeting tomorrow. Finally, Chungli 陳曉東, Jason Lin, will give his C8 speech tomorrow as well, one step closer to becoming a competent communicator. Kate Chiu, who was the president last year and always is a role model in our club, is quite busy recently. I haven’t seen her being active on stage like ages (although only several months). We finally get to see her hosting the evaluation session tomorrow. By the way, we will have 2nd round gathering tomorrow to celebrate, no, to give Nailing our suggestions on her champion speech in Div E. She will represent Div. E to compete the international speech contest at 圓山大飯店on 4/30 and 5/1. This is the first time in history Chungli Club advances to the district level. Let’s help her to win another trophy back. Joining toastmaster meeting is definitely the best way to start your weekend. I am looking forward to seeing you at 凡是美2F 7 pm (3/25).